A herbal garden took root in the premises of Ananda College Colombo 10, to mark World Environment Day on 5 June. Continuing an island wide school program – the Herbal Garden Project, Siddhalepa together with the staff and students of Ananda College Primary School, planted many varieties of herbal plants in their college grounds. Present at this ceremony were Principal, Primary College, Saman Chandana Randeniya, Vice Principal Primary College, Randika Perera, teachers in charge of environment, Gnanalatha Matharage, Sumila and managers from the Siddhalepa team. 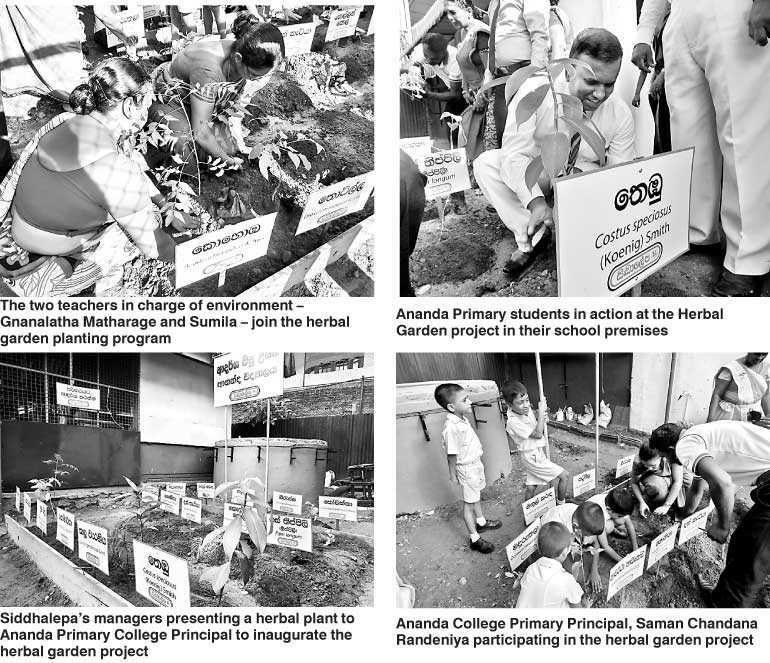 The setting up of a herbal garden in Ananda College in the heart of the city of Colombo is a continuation of Siddhalepa’s CSR program herbal gardens which was launched in 2010 and has so far seen more than 25,000 plants coming up in schools in all parts of the country. About 50-100 plants, selected according to the climate and soil of the area, are supplied to each school. Siddhalepa also donates all the necessary tools and utensils to prepare and maintain these herbal gardens. By distributing large quantities of ayurveda herbs for the school gardens, Siddhalepa has encouraged schools to plant ayurveda herbs and educate the younger generation on the value and use of ayurveda medicine. Our younger generation is not too familiar with ayurveda herbs and their value and effectiveness in treating illnesses. Siddhalepa has taken this opportunity to tell them about the value and importance of such indigenous herbs and the need to grow more herbal plants and trees in home gardens. While there is a shortage of ayurveda herbs in the country, this grow green campaign in school gardens would replenish dwindling supplies and make school children familiar with these herbs while promoting green conservation. Many schoolchildren’s enthusiasm about herbal gardens prompted them to persuaded their parents to plant ayurveda herbs in their home garden as well, thus encouraging a higher than expected growth of ayurveda plants in the rural areas where land was in abundance. This course of events would be hugely advantageous to the domestic ayurveda herb supply in future years. By promoting the herbal gardens in school Siddhaepa is also encouraging entrepreneurial skills in the young to invest time and energy in planting herbs which can being them an income. As a leading Ayurveda company, Siddhalepa has taken on the responsibility to educate the younger generation about the value of Ayurveda herbs in curing a number of illnesses and also in maintain a balanced health. The company invites Ayurveda doctors to talk to children about these aspects as part of the herbal garden project. Consistently and courageously championing the green cause, the Siddhalepa has been among the country’s annual environment award winners in the past few years. At the Presidential Environmental Awards 2016 the Hettigoda Industries was recognised for its commitment to the environment in the Industries category with an award. The Hettigoda Group has a long history of recognition at Environment Awards. The Group has been among the winners at the National Cleaner Production Awards for water efficiency, material efficiency and production practices from 2009 to 2011 and won a Green Award for the second consecutive year.